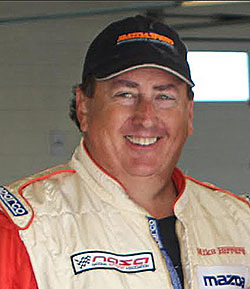 Mike started drag racing his street car as a teenager in Southern California. Mike spent a few years working for a race engine shop where they built mainly big block Chevy drag motors. Mike also raced motocross in the early 70s when he had to convert street enduro bikes into motocross bikes. This is when he realized it took a lot of money to race so it went on the back burner until he started racing Spec Miata. After moving to Park City Utah in 2007 it all started with Mike taking his C5 Z06 Corvette out to Miller Motorsports Park for an SCCA open track day. After the humiliation of not being fast, he realized that he didn’t know how to drive on a road course. So Mike enrolled in the Ford Racing School at Miller and after 4 days, he knew he would never drive his Corvette as hard as I learned how to drive those Mustangs. After much research, he swallowed his pride and decided Spec Miata was for him. Mike built his 1999 Miata with the help of Larry Carpenter of Carpenter Motorsports in the winter of 2010. 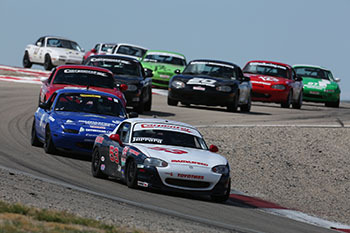 After 3 winter shortened seasons in Utah, he realized that SM was not just guys racing Barbie cars, but maybe the most fun and competitive class to drive. It came together when Mike installed a Mike Rossini engine in his car in 2013. He now felt a competitive edge with the other SM’s he was racing with. This fall he had the opportunity to race at the ARRC with the Rossini team. Road Atlanta is the first of many tracks he plans to check off on his bucket list.